That's great! Hey - are you guys from Texas? I was looking at E's pictures and saw the pics from your Texas trip! Just curious! Thanks for the comment! I feel like I know you and Eleanor so well! When we come to visit Jason and Robin, we'll have to meet you!! 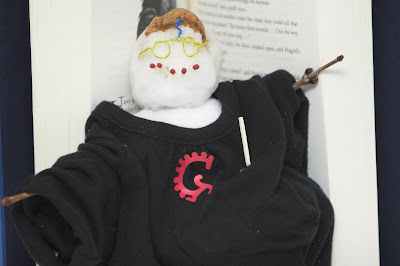 I love Harry Potter and am impressed with the snowman! Is it still snowing there? I'm glad you finally got to make a snowman! Luckily, it has stopped snowing, and is mostly melting today. The temp is about 38 or so. The snow is pretty, but I'm hoping this was the last of it this year! I bet he just became invisible since he was a Harry Potter snowman, and he just left his clothes behind to fool you. Hey Megan - happy monday to you! Hope it is warming up for you! It has been so windy here! Where in TX are you from? We live near the border of TX and OK - Lake Texoma! Ah Yes - Gilmer - we spent a week there at summer camp with our church teens at Camp Gilmont! We live near the Dugans! Very cool! Saw you met Margaret... she is such a sweetie!